On Sunday morning I brought my mum over to mass in Miltownpass as it was Granny's 9th anniversary mass. I seem to have spent quite a while this summer in graveyards and churches. I wonder if it's just an Irish thing, but we do seem to honour our dead a lot. When they are alive we celebrate their birthdays and when they die we celebrate their deathdays! Sitting in the church with my aunts and cousins whom I hadn't seen in ages, I realised that it's not just about remembering our dead relatives, but also a great chance to catch up with the live ones! Looking at my mum, her four sisters, my three female cousins and their daughters, it struck me how female-heavy our family is. By that I mean, there are far more females than males, not that the females are particularly heavy! 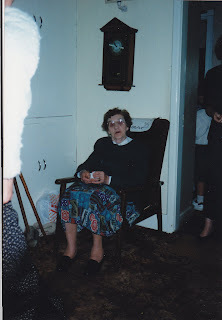 And the matriarch in this family certainly had been Granny Keena! I remember that as very young children when we were "bold", we were not threatened with "the naughty step" but rather with "Granny Keena." We were afraid of Granny as she took no nonsense. We lived out in the countryside, also known as "the sticks". Granny lived in the village of Miltownpass. When we went to visit her, we were allowed to go to the shop, provided we stuck to the footpath. Believe me, this was a great novelty. She would give us money to buy.......yes you've guessed it, chocolate swissroll. The reason for this was because it was my favourite and as I was the "baby" of the family I got my own way.........most of the time. I think this is a lovely thing to be remembered by. I wonder what it is that will remind people of me in years to come. Whatever it is, I hope it's decadent! She was hale and hearty for ninety years and it was only in the last few months of her life that she was confined to bed. I could do ninety years on this earth if I'm in good working order! I want to be ninety and getting my hair done because there is a man coming into my bedroom! Granny was a fantastic singer (which I'm NOT!) but like her, I love music of any sort, especially a good old singsong. "Now, that's enough of that"
"Look at all these people here. What a waste of a good singsong!"